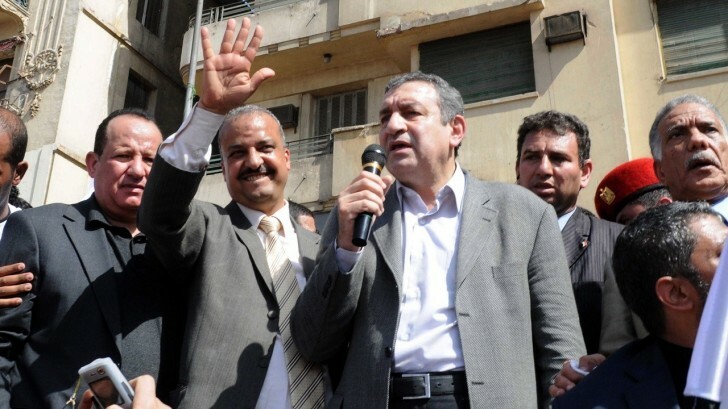 Essam Sharaf became Prime Minister of Egypt on March 3, 2011. On March 4 he addressed the pro-democracy activists at Tahrir Square alongside Mohamed Beltagy, a Muslim Brotherhood leader. Sharaf strongly opposes normalization of ties with Israel. His chart show Sun conjunct Uranus which indicates his appeal with the rebellious protesters. The chart is set for noon because we don’t have his birth time. Unless Saturn is strong in aspect to one of the angles, he would be more progressive or radical than conservative. Sun is in constellation Gemini, fixed star Castor, which when Robson says give prominence in “government work dealing with foreign affairs” . Sun conjunct Venus will give him the charm and appeal to make a good leader. Venus is in Canis Minor on the fixed star Proyon, “associated with the Church” . So here we get the possibility of ties to the Muslim Brotherhood. 1. Fixed Stars and Constellations in Astrology, Vivian E. Robson, 1923, p.155, 192. 4 hs cancer uranius/sun conq closing in on venus all in close aspect to 11hs pisces/moon and second hs @15taurus/jupiter you have the doting over protective dad. you also have a man that no one really knows. He is a great actor. in fact, the 7th house saturn in libra desires to set the record straight but this man will never give up secrets, 8house 7mars/scorpio, (aries rising) He will do a lot for home and family, setting up groups like extended families…collectives if you will that take care of neessities, rule close to home. Be fun to watch this man consolidate power and look beneath his many layers. The pisces moon is lovely. watch out if you hurt somebody he knows, pisces moon in 11 will take all of egypt under his wing. great healer, leader. he needs to watch his own health especially at the dinner table. 12hs pisces moon that is strong, people will really love this man, love that will continue long after death. fello pisces moon Lincoln, elvis, sinatra love for them grew after they were gone. essam’s aries rising will keep up appearences but this is a deep guy. The fifth hs leo is full, pluto,mercury,sn but supressed by nn 11 hs aquarius. he’s a workaholic, likes social discourse but not exatly a party animal….more like a wet blanket. Hi Lucy. I agree about the Moon because it’s trine Sun Venus, very appealing to to public. With this chart though we can’t rely on the houses because we don’t have his time of birth. I just used noon and set the AC as 0 Aries. compared to the Egypt chart – His Pluto is conjunct Egypt Pluto, so he’s carrying the nations potential for deep change – His Sun (stellium) is conjunct Egypt Uranus+ Mercury so Essam has the conscious drive to bring home Egypts revolutionary values and communicate them in a meaningful way – His Saturn is conjunct Egypt Neptune+Saturn so he can resonate with the worldly vision of the Egyptian people and reflect it back from the 7th in partnership with them – Essam’s North Node is at the action point of a yod with the Egypt Moon and Mercury, so his place amongst the people completes his own life mission through clear and deep feelings for his worldly work in building a home for the Egyptian identity – Essam’s Moon is sextile Egypt Sun, so he is a true reflection of their values – Essam’s Mars gives strong appreciation of Egypts histroy and traditions, and is opposite Egypt’s 1st ho Venus – he will be much loved for this and at the same time be challenged to balance these traditions with Egypt’s relationship’s in a chnaging world – his Saturn suggests he will have the balls to do it and be a tough but far seeing negotiator – a Pharsee?! Essam will seep in slowly, want people to like him. mercury heading toward pluto, (sextile 7hs mercury) creates a future by pealing the present and eases the neptune sun square, that at times makes him reject anything that doesn’t look solid likewise anyone who deceives, lies to him. 8th house mars in scorpio he’ll want chemistry, (the right vibe) and uranius/conq sun cancer is fairly high strung, so a collection of the right people that times he can hide behind, (12 hs moon), retire, reinvigorte and show a lot of pizzazz. yes and charming, definately a ‘behind the sceens’ guy. he’ll have a ‘bad cop handle personle, all the while being sweet. it is the chart of a singer too bet he as a great voice, draws people in. If i was given this chart blind id say, builder first because of the neptune square sun a great need to see the fixed form, jupiter taurus, set designe, production, acting, classic opera. BUT venus cancer loves politics so….i don’t know he looks egyptian! my sister married a koptic all 6’5 of him….her step kids have nose like essam. the trouble is mubarrack was secretive so this guy is supposed to be an improvement? Good point, about the nose 🙂 but also he should be more open than Mubarrack because of Sun conjunct Uranus. Thanks Lucy, I don’t like the ocean or swimming much at all.